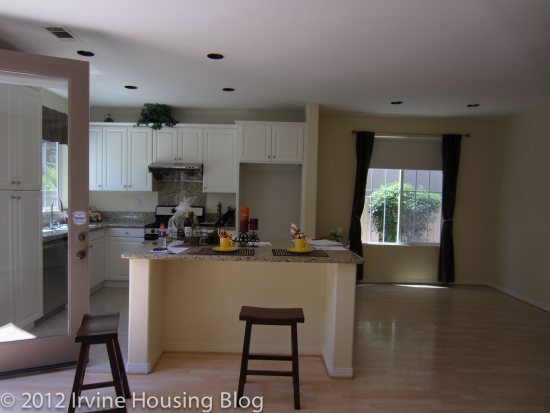 This week, I toured a home in the Arden Square community of Northwood Pointe. Though technically categorized as a condo, this is a fully detached home with no shared walls and a private backyard. There are two sets of HOA dues, for a total of $120 per month, plus Mello Roos. The realtor mentioned that they did a fair amount of work to get the home ready for showing, but somehow my first impression was still that it felt a little tired. 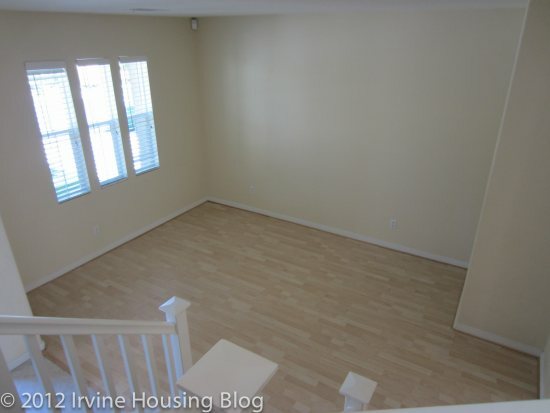 It doesn’t have any major flaws and it is move-in ready; however, if I was buying it, I would definitely repaint and possibly change the carpet to give the home a fresher, cleaner feel. Upon entering, the first thing you see is the formal living room, a somewhat small, square room. While it isn’t large, it is a nice extra space that could be used as a living room, office, or playroom. The only downfall with using it for something other than a living room is the need to keep it clean if company comes over, since it is right in the open when you enter the home. 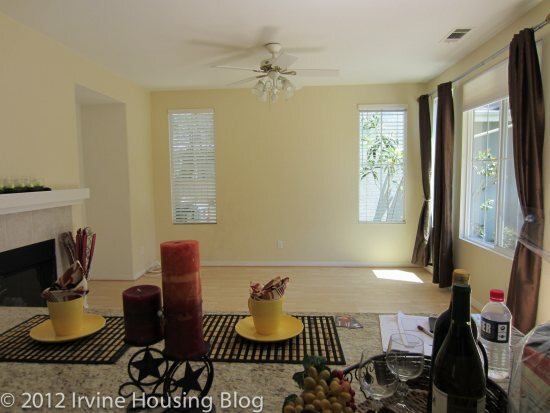 Beyond the living room is the great room, with a kitchen, dining area, and family room. The family room has a fireplace, a small alcove for a TV where you could install built-in cabinets, as well as many windows and doors to the backyard. It is a good sized room with lots of light, and it is totally open to the kitchen. 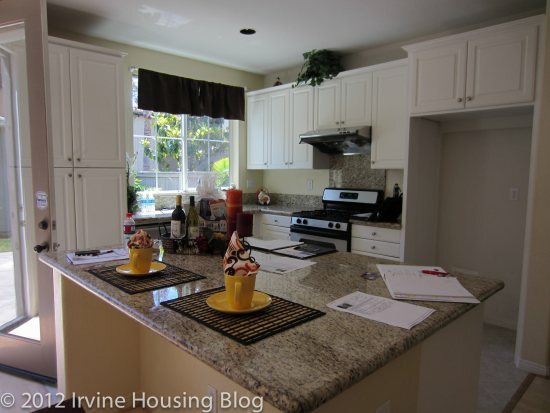 The kitchen has granite countertops and an average-sized island with room for two barstools. The appliances are stainless steel and the cabinets are white. It doesn’t have a lot of cabinet space and, aside from the island, there isn’t much counter space either. 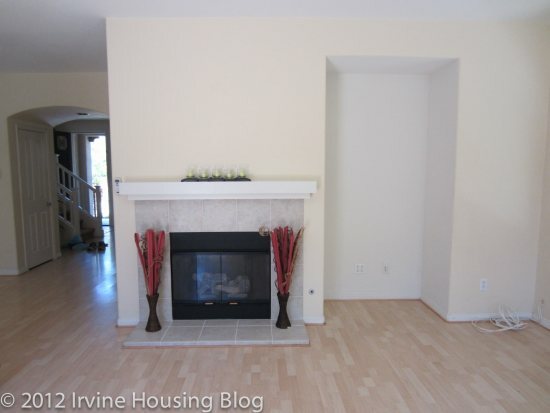 Because it is open to the family room and dining area, it feels bigger than it actually is. If you’re someone who cooks or entertains a lot, it’s probably going to feel a little too small for you. On the bright side, there isn’t room to accumulate clutter! The adjacent dining area has room for a large table and can work as either a formal or casual space. Moving upstairs, there are three bedrooms and a laundry room, all off the same hallway. The first bedroom is average sized with lots of windows and a two-door sliding closet. The other secondary bedroom is much smaller. Both rooms are pretty ordinary with nothing remarkable about them. 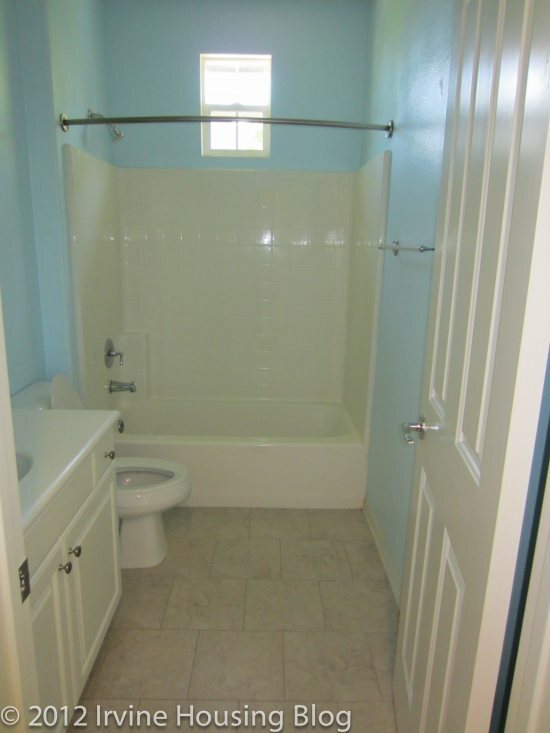 Likewise, their shared bathroom is fairly small, with only one sink and a shower/tub combo. The master bedroom has four windows, so it gets a lot of light. It is a large, square room, again without any interesting or notable features. 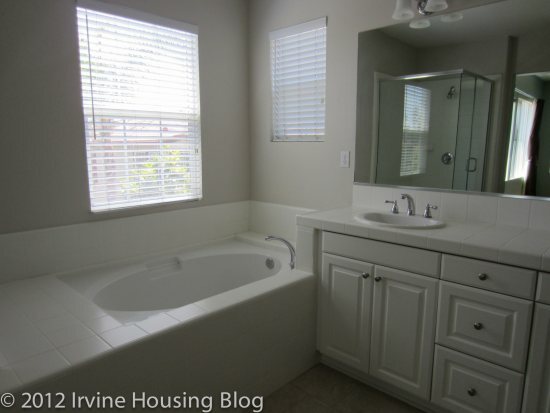 The master bath features two sinks, a bathtub, and a separate, somewhat small, shower. It has tile countertops and white cabinets. 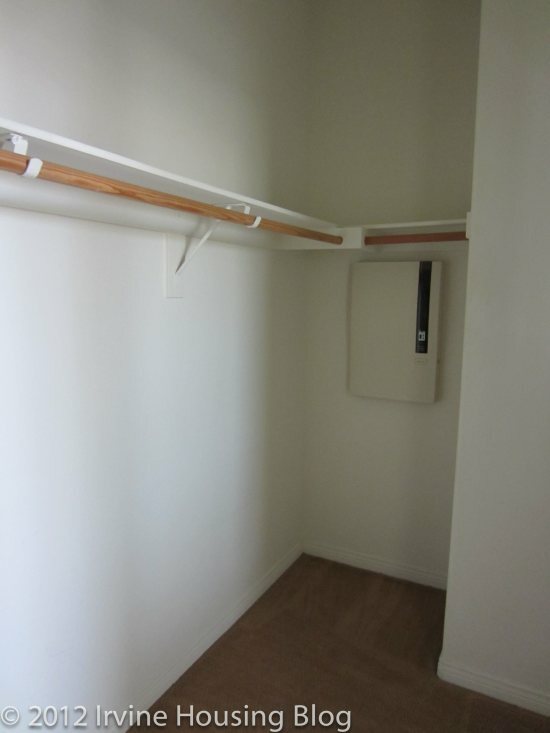 The walk-in closet is at the back of the bathroom and, while it will have plenty of room to store your clothes, it is pretty narrow and would definitely benefit from more shelving. The backyard is surprisingly large. About half is grass and half is the patio area. 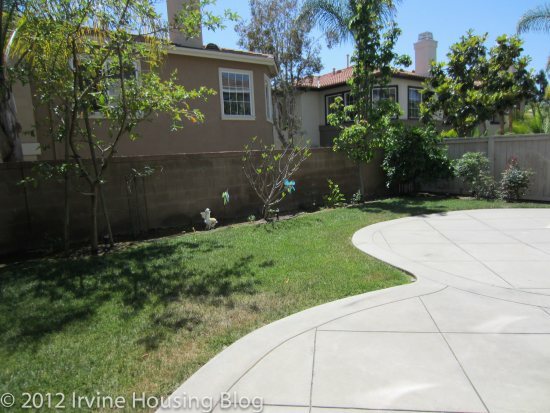 It also has a wide side yard on one side of the house. 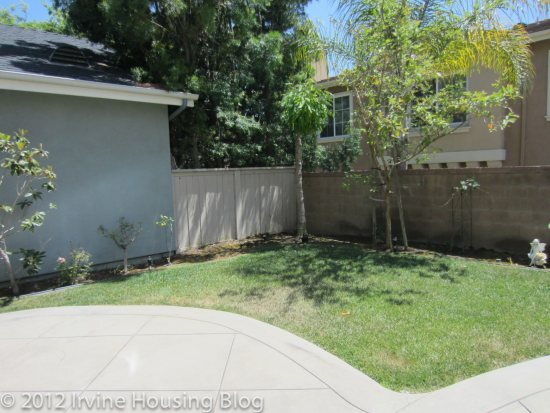 After seeing many tiny yards in other homes, it was nice to see a yard that you can actually use for entertaining, playing, or simply relaxing. Overall, the house strikes me as very plain and it seems smaller than its 1800 square feet. With a couple of exceptions, it lacks the nicer design elements of many other houses built around the same time, such as arched doorways, built-in cabinets, and extra large kitchens. 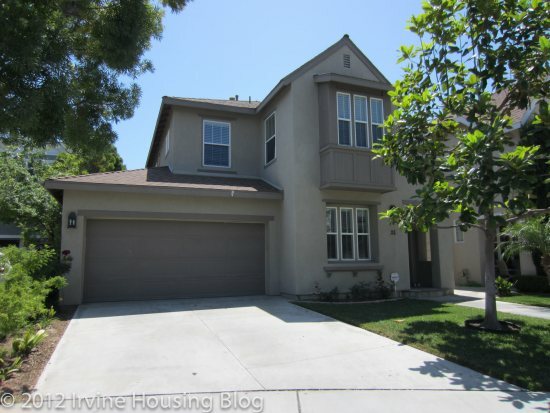 On the positive side, it is close to both the elementary and high schools and it has access to its own community pool in addition to the Northwood Pointe community pool. It didn’t make a strong impression on me, but I’m sure it will be the right place for someone out there. Discuss below or on Talk Irvine. 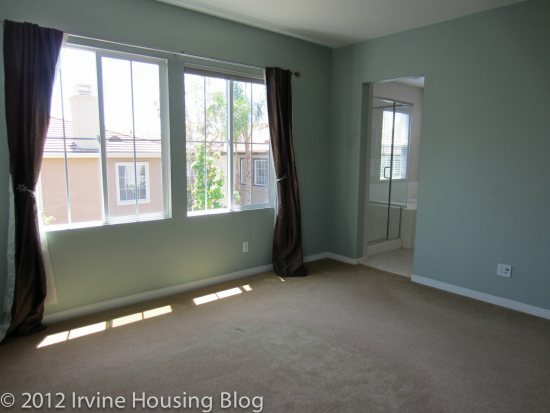 This entry was posted in Real Estate Analysis on May 31, 2012 by Karen.